There’s a perfect pair (or pairs!) of glasses out there for everyone. With so many frames to choose from at Zenni, finding the most flattering style for your face can seem like a challenge, but it doesn’t have to be. We created a helpful infographic that breaks down which glasses styles work for each face type, but in this post we’ll go in depth on finding the best glasses for oval faces and then offer some of our favorites to make your choice a bit easier. An oval face is defined by higher cheekbones and a chin that is narrower than the forehead. Frames that sweep upward complement the cheekbones and slim down the jawline. Steer clear of narrow frames and frames with heavy design elements, as they might add a bit of unnecessary length to your face shape. 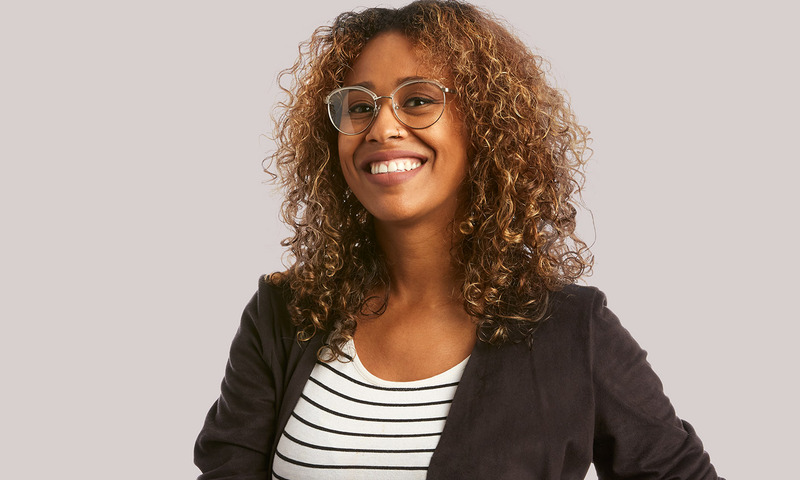 We recommend choosing frames than lean more toward rectangular and square shapes, but it’s mostly a personal preference as people with oval shaped faces can rock nearly any frame shape in a flattering way (lucky you!). The contrast from square-leaning frames provides the perfect complement for oval shaped faces. Try this modified aviator with thin titanium rims for a classic and sleek finish to any outfit. Light and flexible, these hip glasses are built with memory titanium material and offer a nice alternative to traditional aviators. Love the vintage-inspired edge of a browline frame but want a softer feel? Try this timeless silver browline frame for an ultra-flattering finishing touch on your everyday look. With a sleek, brushed-metal rim and glossy acetate arms, it’s both contemporary and statement-making. For a warmer spin on classic browlines, don’t miss this bronze and tortoiseshell combo that gives these frames a sophisticated, timeless finish. Stylish and affordable, these glasses give you an elegant look for less that’s perfectly suited for oval shaped faces. Looking for a simple, versatile frame in a neutral color? These gray-brown square glasses work with every look, from casual to formal. This soft, goes-with-everything color scheme and sleek, streamlined frame shape is ideal for complementing an oval face while adding an element of polished cool to your look. For a geometric take on a half rim frame, these modern, angular glasses are a must-have. Made of lightweight titanium and featuring cut out temple details, they’re a lightweight, high-quality way to make a statement in your everyday look. The translucent acetate trend meets geometric colorblocking with these contemporary glasses. Made of ultra-lightweight TR90, these frames feel weightless while making a big impact. This angular shape with smooth edges is ideal for flattering an oval shape face and adding an extra pop to your look. Try them in gradient brown with blue temple arms or classic black. Love the idea of a pop color frame but don’t want to go crazy bright? Try these forest green rectangular glasses for a striking, modern finish. Turn heads with the two-tone matte overlay and stay super comfortable with the lightweight, flexible fit. Can’t get enough of old school glamour? These oversized cat-eye frames with pearl detailing are an elegant and showstopping accessory to any look. Thanks to a TR90 construction, these bold eyeglasses are feather-light, so you’ll feel comfortable and look effortless chic. For a subtle touch of Southwestern flair, don’t miss these earthy, matte aviator glasses with textural detailing on the arms. Whether you’re pairing it with bright colors or muted hues, this desert green shade is a stylish addition to your look. The bold shape and elegant finish is an ideal combination for accentuating an oval face shape. Square keyhole frames will never go out of style – and they’re one of the best-suited frames for oval face shapes. Try this iconic silhouette in a bold, moody blue for a style statement no one will forget. With clean lines and a vintage-inspired shape, they’re the perfect mix of classic cool and modern edge. Finding the best glasses for your face shape can be difficult, but it doesn’t have to be here at Zenni Optical. Browse our incredible selection of stylish, one-of-a-kind frames perfect for oval face shapes to find your next favorite pair. Make these glasses the centerpiece of a new outfit, or make them your everyday statement piece – no matter what, you’ll look and feel fabulous and polished. If you’re not sure that your face is oval-shaped, try these other guides for choosing frames for diamond faces, heart-shaped faces, square faces, and round faces!